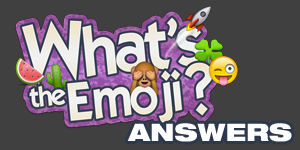 What's The Emoji Answers is your reference guide to get you through parts of the game that leave you stumped. If you are a fan of this game, bookmark the page for future information on release updates, tips, hints and more. If you would like to interact with other fans of the game, visit our Facebook page and join the conversation. What's The Emoji Answers | Whats The Emoji Cheats This site is not endorsed by or affiliated with Cheat Master And Friends Words Cheats LLC.